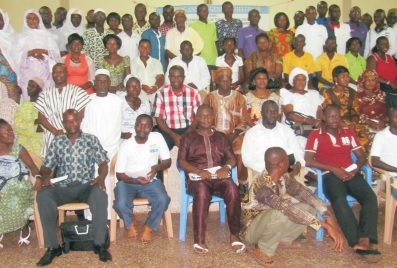 Recently, a maiden meeting was organized for a selected Civil Society Organisations in the Central Region who in one way or the other have interest in mental health and development to form an alliance in the Central region. As part of collaboration between Mental Health Society of Ghana (MEHSOG) and BasicNeeds Ghana (BNGh) in implementing activities under the project “Support Government of Ghana to build a national Mental Health System that effectively and efficiently responds to the mental health needs of the population”, a project funded by the Department for International Development (DfID) UK. The Central Regional Alliance for Mental Health and Development was launched on the 11th of September, 2014 at the Sasakawa Guest Center, University of Cape Coast by the Central Regional Minister. The program started at about 10:30am, with an opening prayer from a participant and user of psychiatry. In his opening remarks, Humphrey Kofie, the Executive Secretary of MEHSOG welcomed members especially the Omanhene of the Oguaa Traditional Area and also apologies for the late start of the program and commended the chief for the fact that, participants who should have been seated before his arrival rather the opposite happened where the chief arrived more than 30 minutes before start of the program. Mr. Kofie continued with the introduction of the Chair for the occasion, Osabarimba Kwesi Atta II, Omanhene of the Oguaa Traditional Area. In his acceptance speech he applauded the organizers for the event as well as the invitees for making it to such an important programme. He requested their support to steer the affairs of the event to the end. He was therefore not happy for the late attendance to programmes, he said “I came here for almost an hour waiting for participants to seat for the start of the program, this are programs we should attached importance to” and further added that the alliance should ignore people who does not attached importance to their work and progress to support the vulnerable in our society. The Executive Secretary of MEHSOG continued with introduction of himself and his colleagues present and also gave brief background of MEHSOG and BasicNeeds Ghana as well as the purpose of the meeting. He said the purpose of the meeting was to officially launch the Central Regional Alliance for Mental Health and Development. He emphasis on the partnership between MEHSOG and BasicNeeds Ghana in collaborating to implement a project tilted “Support Government of Ghana to build a national Mental Health System that effectively and efficiently responds to the mental health needs of the population” with funding support from Department for International Development (DfID) UK for 5 years and a year is already spent. He said the membership is made up of different Civil Society organisations in the Central Region whose core mandate are not necessarily mental health but has has passion for it and has come together to advocate for mental health and development. The alliance is to create a platform for discussing and shaping mental health policies and legislations. It will also provide the platform for sharing information related to mental health in Ghana, providing alternative human centered solutions to mental health in Ghana. He added that, it is to foster the needed collaboration with relevant stakeholders in a desire to support the enhancement of community mental health to meet the needs of people with mental illness. In a fraternity message read on behalf of users of psychiatry, Ms. Celestine called on the government to support all people with mental health problems by enrolling them to existing social intervention programs eg. Livelihood Empowerment Against Poverty (LEAP) and National Health Insurance Scheme (NHIS). The representative of the Central regional Director of Health Service said, the Regional Director is currently on leave and the acting Director is attending to equally important national and regional health issues and has therefore assigned him, Mr. Justice Havosa, the Deputy Director of Nursing Service to stand in on his behalf and apologize for not being there personally. He said, they are very grateful to organizers of this event for extending an invitation to them for such an important event and equally excited about the launch of Central Regional Alliance for Mental Health and Development for various reasons. He therefore congratulated MEHSOG and BasicNeeds Ghana for such courageous and vision in addressing mental health issues in the country. In his speech, he illustrated a history of a lady with mental disability as reported by Human Rights Watch in 2012. Doris Appiah-Danquah, who happen to be a past executive member of MEHSOG, after 19 years in prayer camp and psychiatry hospitals, she was discharge and started receiving support from BasicNeeds, a local organisation that serves people with mental disability. BasicNeeds introduced her to their other members for peer support, and to community nurses. Gradually her health improved and in 2005 she started advocating for rights and better living conditions for persons experiencing what she had gone through. 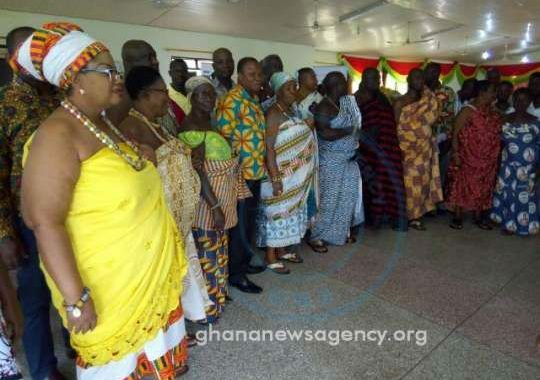 He said his region will do all that they can to support the effort of the alliance, he also informed the gathering that the school of nursing at UCC will be mounting a course in community mental/psychiatry nursing very soon and edged the organizers to work with the community health officers in the region. After his presentation, the meeting went for a short coffee break. In his presentation he expressed his gladness to the organizers of the program who deem it fit to honor him by an invitation as the guest of honor. He said inaugurating the Central Regional Alliance for Mental Health and Development which his administration is ready to support, he understand is a region based civil society organisation with similar ones in the Upper West, East, Northern, Brong Ahafo, Ashanti and Greater regions. He stress that a flagship policy that has remained close to the heart and mind of the government since it assumed office in 2009 was the mental health bill which has now been passed and known as Act 846, he emphasize the president continue demonstration and commitment to the full implementation of the Law and also the inauguration of the mental Health Board and establishing the mental Health Authority. In concluding, he said government is committed to get the Legislative Instrument for Mental Health Act passed and in the light of the above, he declared the Central Regional Alliance for Mental Health and Development Launched. In his closing remarks, Osabarimba Kwesi Atta II, Omanhene of the Oguaa Traditional Area who chair the program encourage all to advocate for the vulnerable groups in the society especially people with mental illness. He challenged and edges the authorities to implement the Law to the fullest and bemoan experiences where laws are passed but little is done to implement them. The program ended about 1pm followed by a group picture and lunch for participants.